I am an ordained minister through the Universal Life Church and can perform your wedding ceremony as a clown, costumed character, or plain-faced fool. I can provide pre-marital consultation based on principles of Compassionate Communication [NVC] and Laughter Yoga with an emphasis on partnership as play. Justin clearly understands how to use humor to enhance an event or occasion or even the experience of worship. At the same time he recognizes the need to maintain appropriate limits so as not to overwhelm. He, also, recognizes that while most people love the antics of clowns, there are those who have difficulty with them, and he respects those limitations. If you or your organization are planning an event at which you suspect good humor or even glorious silliness would enhance the occasion, I encourage you to speak with Justin to see what arrangements he and Jusby could make. The conversation, at least, will be worth your time. Jusby has performed the Ritual of the Pieing at the Jewish Festival of Purim for Temple Beth Hatfiloh each Spring since 2010. He also performed the Ritual (with Kosher Pies) at the Hanukkah gathering for the Chabad Jewish Discovery Center. At large scale pie events, Jusby brings an entourage of assistants. (Jusby) clearly understands how to use humor to enhance an event or occasion. He stood out during Purim which, in Jewish tradition, is all about silliness! And understanding that clowning is not for all, he respects limitations and never pressures anyone to participate who does not wish to. 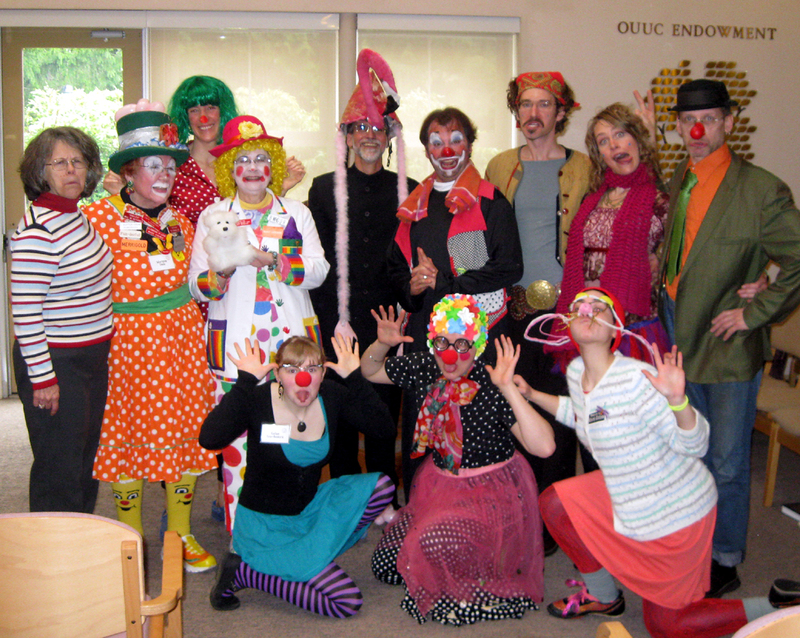 Jusby co-created the April Fool’s Service for the Olympia Unitarian Universalist Congregation. Again, Jusby was accompanied by an entourage of assistants. Jusby performed opening ceremonies for concerts by guest artist Celia Farran, benefiting the Olympia Covenant of Unitarian Universalist Pagans. Thanks so much for presenting to our congregation last month. We love laughing with you. As Unity is a healing movement, it was wonderful to hear about the “proof” of the value of laughter in the world of health and well-being.When you began your lesson and you asked us all to stand and take a pledge to accept our laughter and the laughter of those around us, I felt inspired! And when you closed your lesson with an invitation to laugh – for no better reason than “it feels good” – I was filled with joy! I am grateful to have hosted you here at Unity of Olympia and hope that many others have the opportunity to be with you…and laugh!